"We love our new porch! "Thanks for a clean pool inside and out. Thanks for an accessible back pool gate. Thanks for the flowers especially. Can't wait to see them planted. And thanks for that, too." "Gotta praise the weekend emergency team! Noticed that the refrigerator had quit working at 5pm on a Saturday afternoon (by finding thawed meat in the freezer - yikes!!) and by 7pm, same day, had a brand new one installed & working! Guys were great, helping me unload and load -- cleaned up after themselves. It was wonderful!! A BIG thanks to everyone involved!!" "Thanks a bunch to the maintenance staff for promptly fixing the problem with my toilet! It was making so much noise before. The silence is wonderful." "Thanks for getting our bedroom screen repaired and replaced before warm weather returned. It required more than one attempt, but you persisted over several days and got it done. "Good luck back at school and thanks for keeping the pool in such fine condition this summer, Adam. Traver Crossing, a fantastic apartment home community of Ann Arbor, MI. Our spacious one and two bedrooms include amazing walk in closet spaces, open and bright kitchens, oversized patios/balconies and linen closets. 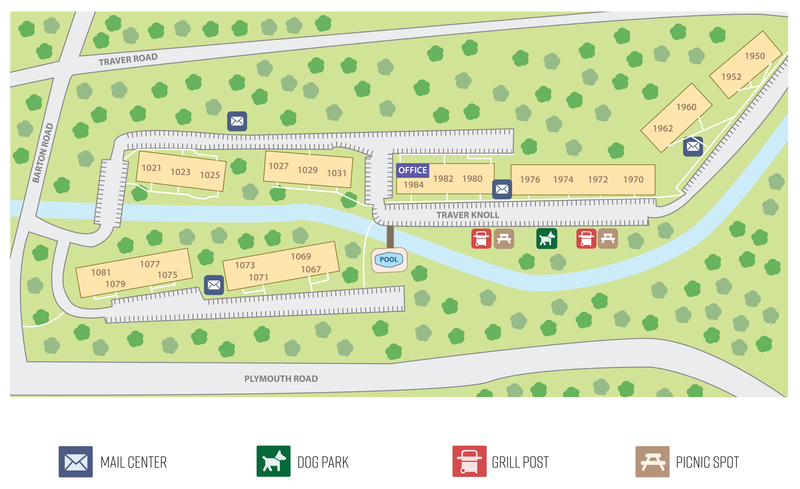 Our pet friendly community features a scenic dog park, swimming pool, walk trail and free open parking. World class dining, entertainment and shopping are only a few moments up the road including the University of Michigan-Ann Arbor.